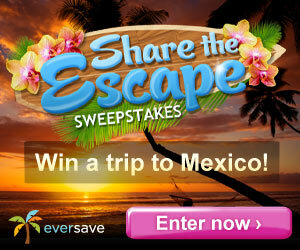 Enter to Win a Trip to Mexico & Today's Eversave Deals 2/28 | A Savings WOW! Enter to win a six-night stay in a private villa at Cerritos Surf Colony in Todos Santos, Mexico, plus a $500 American Express gift card from Eversave. You can also visit Eversave’s Facebook page where they’re giving away ExxonMobil Gift Cards, Save Rewards, and Eversave tote bags every day for the next two weeks, until they announce the grand prize winner on March 7th! Today’s Save:$25 for $50 worth of photo prints in any size from ezprints + free shipping! Today’s Save:$11 for two pairs of Remedy™ memory foam insoles + free shipping! Today’s Save:$10 for $20 worth of shoes, bags and more from Shoebuy.com + free shipping! Today’s Save:$29 for a teeth-whitening treatment from Pro White Teeth + free shipping! Today’s Save:$269 for a three-night stay in Negril + lunch credit + reduced-rate additional nights – Use promo code JAMAICA for $25 off! Find more deals on Eversave today!